The Independent carried a mischievously misleading front page report last week, hyperbolically headlined ‘Lib Dems rocked by anti-Clegg rebellion’ — their attempt to stir in the wake of the founding of the anti-Coalition Liberal Left group. ‘Lib Dems rocked by anti-Clegg rebellion’ shouts your front page (Thur 9 Feb). It’s hard to square this noise with the reality. LibDemVoice.org, an independent website, regularly surveys party members’ views of the Coalition – support for it has never dipped below 83%. True, that means a small minority of Lib Dems are opposed to it, and that’s just fine: as a democratic party we’re intensely relaxed about constructive criticism. 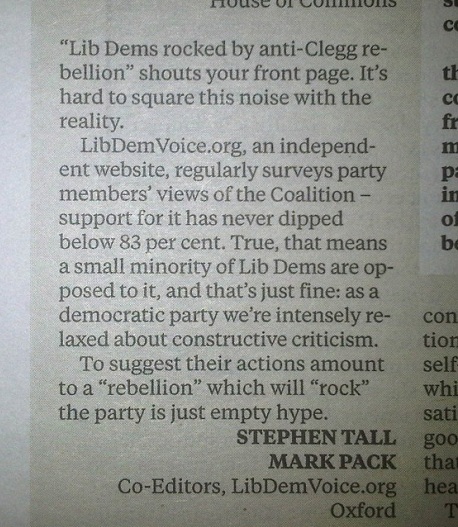 To suggest their actions amount to a ‘rebellion’ which will ‘rock’ the party, though, is just empty hype.